It’s a Tuesday afternoon and I’m looking for a place to bring my girls and help them expel some of the massive amounts of energy they’re filled with. I took them to open play time at Rolly Pollies in East Amherst. I’ve taken my kids to classes there in the past, but never the open play time. I wasn’t quite sure what to expect. 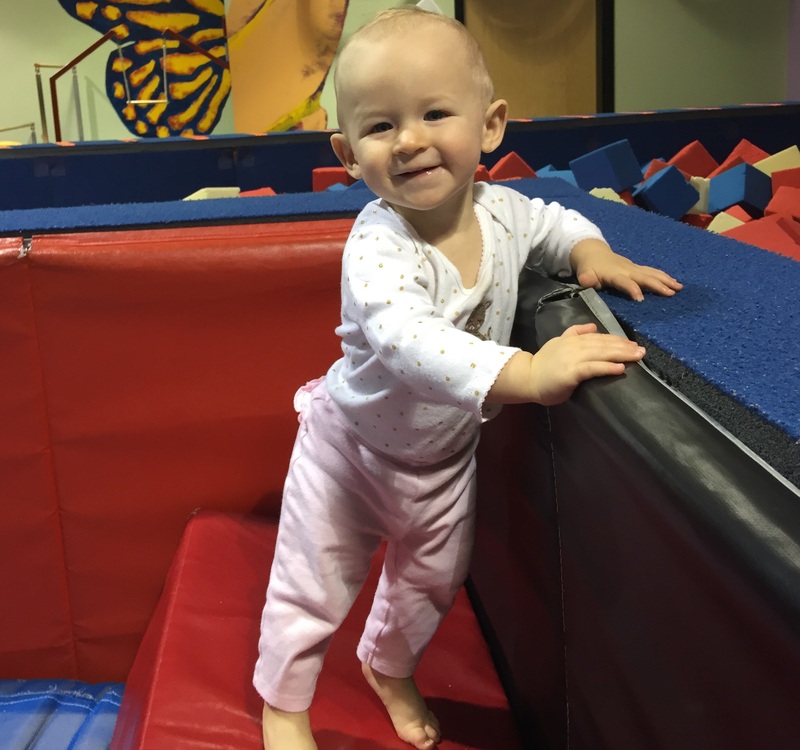 Rolly Pollies calls itself a fitness place for kids, and that is truly what it is. For $10 for the first hour, and $5 for each additional hour, kids have full access to everything in the gym. This includes, gymnastics bars, rock climbing wall, trampoline, bounce house, a foam pit and more. Much more. The idea is to let them run free. While they’re playing, they’re learning, too. My 4-year-old, Emma loved walking the balance beam and jumping in the bounce house. I could hear her giggle practically non-stop. My baby, Ella is almost one and on the move. She loved the open space which allowed plenty of tumbling, sliding, running (as fast as her little legs would move) and just looking around. Although it was a bit of a challenge keeping up with both of them going in different directions, they both had fun. Everything is padded and safe, so I wasn’t all that worried about one of them falling or getting hurt. There were about 10 kids there with their parents or caregivers, too. There were a few babies, several toddlers and the rest were preschoolers. They have a variety of classes, from mommy-and-me to fit tween classes. The staff was wonderful. Emma was trying so hard to swing on a rope that goes into the foam pit, but she was having a tough time. Without being asked, a staff member came over and helped. She gave some advice and before too long, Emma was swinging away. There are restrooms and little cubbies to keep your shoes and socks in while you play. The gym is colorful and very clean. For my girls it was a solid hour of playing; not even a slight water break. They were wiped out and I’m banking on a full night of sleep for both of them. It does seem a little bit pricey, but they had a great time and I think it’s worth it. It gets the kids moving, helps drain some of that energy, lets them socialize with other kids, all while having fun. Open gym is 1 to 4 p.m. Monday through Friday and is for kids ages six months to 12 years old. There are two Rolly Pollies locations: 9630 Transit Road, East Amherst and 4058 North Buffalo Road, Orchard Park. For more info, visit rpwny.com. Mary Friona-Celani – Mary is an Emmy award-winning journalist who spent nearly 20 years as a television news anchor and reporter.